1. Also called Midwinter, the Winter Solstice occurs around December 21 or 22 each year in the Northern hemisphere, and June 20 or 21 in the Southern Hemisphere. 2. It is the shortest day or longest night of the year. 4. The late Neolithic site Stonehenge is aligned to frame the Winter Solstice sunset. 5. The Bronze Age site New Grange (photo above) is aligned to frame the Winter Solstice sunrise. 6. In colder European climates, cattle were slaughtered at this time of year so they would not have to be fed during the winter. This meant that it was last time before spring that a supply of fresh meat was available, which led to a feast. 7. The Roman Saturnalia festival themes of reversal may be tied to the SunÃ¢â‚¬â„¢s ebbing presence in the sky. 10. In the 3rd Century, the Christian Church prohibited the decoration of houses with evergreens. The decorated Christmas tree only caught on in the mid-19th Century. 11. Coniferous trees and bushes came to be associated with the eternal life and became meaningful during Winter Solstice, and later Christmas, because these types of foliage remain green when other plants have died. 12. The familiar Christmas symbols of evergreens, holly, mistletoe, and the Yule log all predate Christianity. 13. According to the Religious Tolerance web site, the actual Christmas tree tradition, wherein an evergreen is brought inside the house, dates to 16th Century Western Germany. These trees were called Paradeisbaum (paradise trees) and were first brought to American by German immigrants around 1700. They became popular in the general population around 1850. 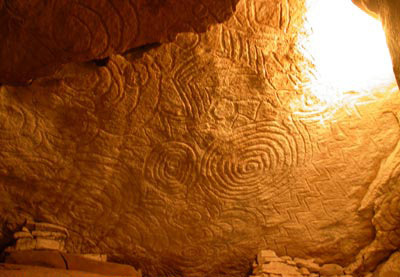 Lovely image from Newgrange! Let’s hear it for the pagans, whose ancient rituals are every bit alive in our own! Very interestin Lisa. I never was as conscious of the shortest day of the year till I moved to Washington State from California. Very interesting list! I knew most of that, but not all. I love information on the Solstices and Equinoxes, especially now when so many celebrate Christmas without acknowledging its origins. Very interesting. I think it’s time Saturnalia was revived! I did not know quite a number of those very interesting facts. One word EXCELLENT!!!! I loved this one. Great job. I didn’t know all of those. Thanks, it was very interesting! Wren Day sounds like fun, cool TT.